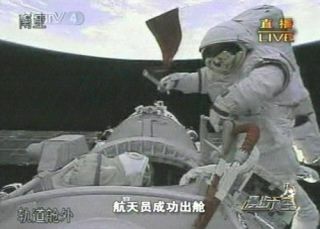 A Chinese taikonaut bears the flag of the People's Republic of China during the Shenzhou 7 mission's spacewalk on September 27, 2008. For the first time, China has included women among the finalcandidates for the country?s newest class of astronauts. The China National Space Agency is in the process of selectingits second batch of astronaut candidates, and has narrowed down the pool to 30men and 15 women, the official state news agency Xinhua reported Thursday.Ultimately, China plans to pick five men and two women as final candidates tojoin the country'sspace program as taikonauts. "It is the first time women have been up for selectionin China'sspace development," authorities said, according to Xinhua. China's fledging space program has already launched threemanned missions, the first of which lifted off in 2003. Last year, Chineseastronaut Zhai Zhigang carried out a 20-minuteforay beyond his Shenzhou 7 spacecraft - his nation's first spacewalk. China is only the third country, after Russia and the UnitedStates, to independently launch humans into space. The 45 preliminary candidates for the second class ofChinese spaceflyers are between the ages of 27 and 34, and all are Air Forcepilots for the People's Liberation Army. The male candidates are all fighterpilots and the female candidates are aero-transport pilots, authorities said.Some flew rescue missions after the massive Wenchuan earthquake in May 2008 inChina's Sichuan province. They "all master excellent flight skills and boastgreat psychological quality," authorities said according to Xinhua. The candidates will now undergo another round of tests,including physiological and psychological checks, to further whittle down thepool. China is reportedly preparing to launch a militaryspace station into orbit by late 2010. The 8-ton Tiangong 1 laboratory isslated to be the first of multiple stations planned. The unmanned Shenzhou 8mission is scheduled to dock with the station sometime in 2011. There is also speculation that the nation is pursuing thegoal of landing an astronaut on the moon, a feat only NASA so far hasaccomplished.